I find the quality of pressing outrageous. In a whole box set there is probably one or two records which plays through nice without any additional noise or distortion (cracks&pops). Records in general are dirty and scuffed; one have scratches on both sides. I really hoped that this box set would be manufactured more carefully. Mixing itself is fine and music sounds great (when there aren't any distortion in sound). Cloth-bound packaging is also a nice touch. Received my copy of the vinyl set today and its a thing of beauty. The pages housing the vinyls are think heavy cardboard, the whole box is cloth bound, as is the huge hardcover book. The sound quality is also excellent. Cost a pretty penny, but it was well worth it in my opinion. Simply stunning, shame about the loudness, prevents this recotd set to be truly perfect. Still waiting for a vinyl box set to come out. Anyone out there connected? Put in the word. Wonderful and impressive set. The quality of these outtakes are just as good as the material that was originally released on the American Recording albums. Indispensible addition. Worth every cent I spend on it! The breadth and depth of Johnny Cash's career is difficult at best to summarize and impossible to quantify by the songs themselves. 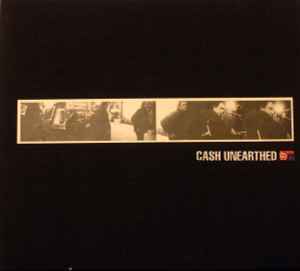 It is therefore advantageous beyond belief that this box set was issued some years back, Unearthed truly demonstrates just how diverse Cash was and what pull he had in the musical world well beyond the rather diminutive confines of Nashville. A system he had no use for whatsoever. Take a look in the liner notes and you'll find everyone from Fiona Apple to Nick Cave as collaborators. Legend does not do The Man In Black justice. Flawed genius is more what I would term his incredible canon of work. Flawed, by the way, only by his own humanity which he understood better than most of us ever will. In my mind, there's no one to replace him and that's the bitterest pill of all to swallow. Sit back and listen through all five discs, time will melt away and you'll be right there in the cabin with JC as he puts his all into those gnarled fingers. It's a riveting world he shows us within the scope of Unearthed and if you don't have this set put down your damn mp3 player, go outside and seek this thing out. Seriously. This is definitive work, the substance of the soul.